Sponsored by Mortar Net® USA, Ltd.
Identify the components of a proper flashing system. Compare and contrast membrane systems used in typical flashing systems. Summarize design methods and materials to provide a moisture-proof masonry wall system for a high-performance building. Review a variety of flashing details for corners, curved walls, and other wall systems. Masonry construction, one of the oldest building systems in the world, requires a complex integration of a variety of elements to control moisture. The construction of a masonry building requires the knowledge of how this material weathers and reacts to seasonal changes such as snow, sleet, wind-driven rain, and humidity. Ancient civilizations building in equatorial zones using 3-foot-thick walls did not have to worry about a freeze-thaw cycle when they chose masonry, stucco, and brick as their most common building material. However, as civilization moved north to more temperate climates, new construction methods reduced the impact of moisture from seasonal temperature variations on buildings. The modern development of wood and steel structural frames with masonry cladding included the development of flashing systems that can expel moisture from these new building enclosures. The main line of defense that protects a wall system from moisture damage is in the construction detailing of wall flashing. Early technical manuals such as the AIA's Ramsey and Sleeper Architectural Graphic Standard as well as 21st century editions provide numerous details for preventing moisture damage in masonry and masonry clad buildings. In the 1939 Brick Engineering Handbook of Design, the author states that at “the outset, it might be stated that no flashing at all is better than poor flashing.”1 The International Masonry Institute and the Building Enclosure Council provides information on codes, technical and non-technical bulletins on materials and techniques. Flashing materials and assemblies require code-compliant standards for durability, plasticity, and permeability. With all of this support, the evidence is clear that the variety and compatibility of moisture-proofing materials, flashing, expansion and control joints are providing many choices for successful field applications of flashing in masonry buildings. Contractors are required to monitor the installation and compatibility of numerous materials specified by design professionals who are often not aware of the specific field conditions during construction. A lot can and does go awry when building a masonry building. There is also an increasing emphasis on the design of high-performance buildings for energy efficiency and durability as part of a sustainable design portfolio. To design a moisture-proof, high-performance building, architects need to carefully detail and specify all of the components that are part of this system. They may also want to choose from a new variety of engineered products that unitize some of the basic components of the flashing system to improve the constructability of masonry wall systems. 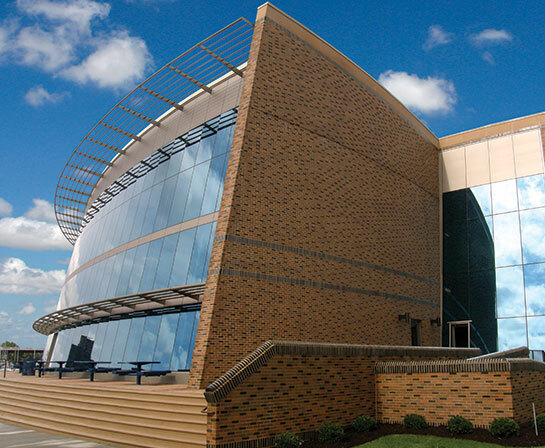 The selection of a unitized flashing system was part of the overall moisture proofing strategy for the Hampton University Student Dining Facility in Hampton, Virginia. Architect of record: Livas Group Architects, P.C. in Norfolk, Virginia.